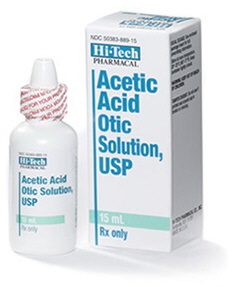 Acetic Acid 2% Otic Solution contains acetic acid 2% as the active ingredient for its antibacterial and antifungal qualities. 0.02% Benzethonium Chloride is used as a preservative to reduce bacterial growth and to promote contact of the solution with tissues. USE: Treatment of superficial infections of the external auditory canal caused by organisms susceptible to the action of the antimicrobial. We recommend using to prevent infection after swimming (swimmer's ear prevention). DOSAGE: Instill 4 to 6 drops into the external auditory canal and while the patient is lying on the side with the affected ear facing upward. Maintain this position for 5 minutes. Repeat every 2 to 3 hours if necessary. PRECAUTION: Not intended to be used when the tympanic membrane (ear drum) is perforated.